The members of this family (Bipedidae) are unique among amphisbae- nians in having retained the shoulder girdle and very functional hands. These forelimbs lie far forward on the body and are so incongruous that the animal has been called “Lagartija con oreilias” or “little lizard with big ears.” They appear to be bright pink, but the color is actually produced by the blood which shines through the translucent skin. 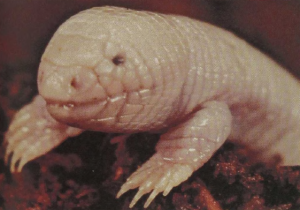 They dig underground burrows and apparently use their forelegs only for making the first entry into the soil and for widening tunnel chambers underground, then flattening them against the body for regular tunneling. The forelegs can fold almost 1 80° at each joint and may consequently be brought forward alongside the body even in a very narrow tunnel. The three known species inhabit different parts of Mexico, with the two-pored species shown restricted to the tip of Baja California.